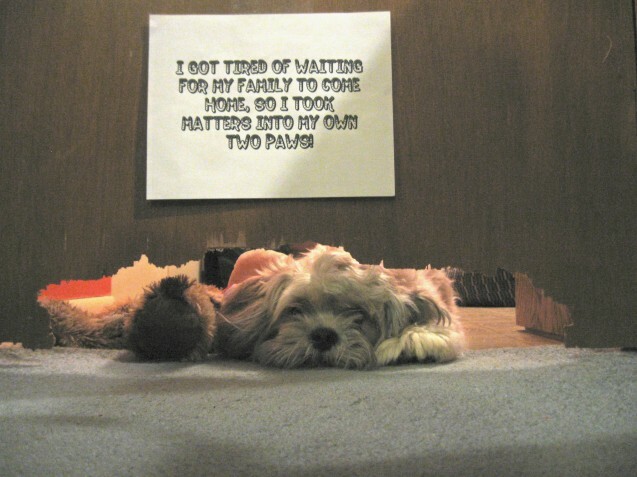 I got tired of waiting for my family to come home, so I took matters into my own two paws! Posted March 6th, 2013 . Oh my goodness!!! It’s only funny because it didn’t happen to me! I’m so sorry. LOL, he/she looks tired after all that work. They must have left the poor pooch a long time, aww. I have one that ate most of a basement door. Not just the bottom part, but over half the door. And it didn’t take him very long to do it. I feel your pain…. but the pup is sure a cutie! came home to find my lab had ate the remote. never did find the batteries.